A rain soaked circuit at Motegi earlier today was the venue for one of the best races of the year. The two remaining contenders for the 2017 championship, Marc Marquez (Honda) and Andrea Dovizioso (Ducati) engaged in an epic battle over the last few laps for the win. 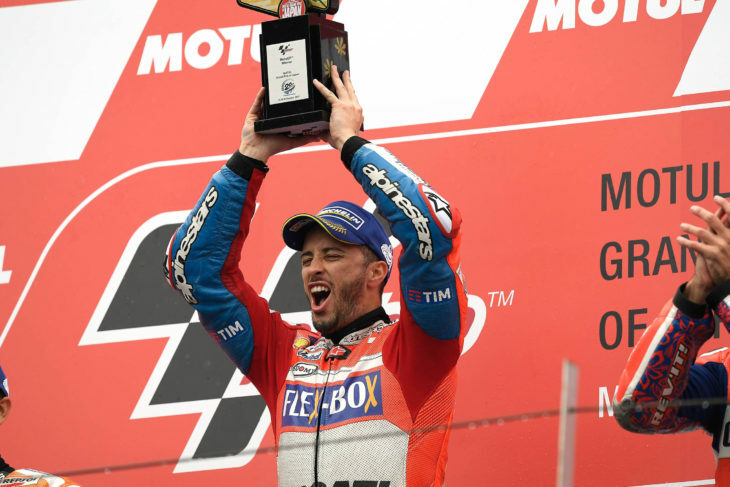 After Marquez dove under the rival Ducati in the final corner, Dovizioso was able to square-up the corner and beat Marquez to the checkered flag. As a result, with 3 races remaining (and a total of 75 championship points still to be counted), Marquez leads Dovizioso by a slim 11 point margin in the championship. Follow this link to full race results. For additional details and points, visit the official MotoGP site. OMG That was incredible! Those poor moto3 kids had a rough time. Puddles were like lakes to those guys. The on board shots were killer, how the hell could they see anything getting wheel spray right in the face shield? Titanium nuggets on the both of ’em. and where was miller in all this rain? Sitting at home with a broken leg. Great Race! Impressed by Dovi’s and MM’s riding. Amazing the lean angles in the wet conditions, kept waiting for one of them to slide out, glad it did not happen. Sorry to see Rossi crash out, his team mate seem to be struggling as well. The racing in the 3 classes this year has been outstanding, with some of the best racing I have seen in awhile! I was yelling so loud my wife in the other side of the house was laughing. OUTSTANDING race. Gladiators for sure. You can get that data at the motogp web site linked in the article by clicking the stopwatch under “schedule and results.” You could compare the results to a past dry race. Top speeds were a bit under 180 mph. Absolutely one of the best last three laps in the 4-stroke era. The last gasp move Marquez made when he shot across Dovi’s front wheel and damn near took him out was pretty reckless. He’s gotten away with these moves many times and I’m afraid it’s only a matter of time until he takes someone out. I only hope it’s not serious when it happens. Other than that, an absolute epic for the history books. Sets up what should be an amazing conclusion to the points championship. Would be great to see an Italian rider on an Italian brand win it all. a lot of moves by all the riders look reckless to us, another day at the office to them. Watching those guys cut under, or behind, front wheels nearly touching rear wheels, gentle nudges to push someone off line, block checks..all a part of racing. Jay and Zarco know what you’re talking about. Indeed. Plus we’re talking the last corner of the last lap between the two most likely championship contenders at this point. Any racer on that grid who wouldn’t have pulled a move like that never has nor ever will take the MotoGP championship. That was a great race to the end. What a show Marquez and Dovi put on. Best race in the entire history of the wheel! Excellent, excellent racing, particularly in the wet, but that would have been exciting in the dry as well. Amazing how hard those two were going at it when Rossi said it felt like he was riding on ice. Amazing save by Marquez as well, cost him the top spot on the podium, but probably saved him from some bruising and maybe pins or plaster. I really like how friendly Dovizioso and Marquez appeared following the race, especially when you consider how ferociously those last few laps were contested. Much better sight than the Rossi/Lorenzo post-race spats, or Rossi/Marquez. Hey, I’m a huge Rossi fan, but I see a trend here. Eh, I think the issue with Lorenzo is Lorenzo. The guy doesn’t have the most happy-go-lucky personality, and (like Stoner) he only seems to be really content when he’s leading the entire race. Marquez and Rossi used to be friendly, before things happened. You’re not gonna settle that argument to anyone’s satisfaction. That was pure balls. Incredible performances by Marquez and Dovi. If you did not see this race I highly recommend that you do. Dovi and Marc put on a clinic on how to race a GP bike in the rain. Really fun to watch. I’m not really the cheering type, but this one had me yelling at the screen on the last lap. Crazy.